Click here for a printable version . IndiGO bus stop signs are placed along routes throughout Indiana County. If you live near a bus stop, locate the nearest stop for your route and wait for the bus to arrive. If no marked bus stop is nearby, wait on the same side of the street as the bus travels. Wait at a safe area and "flag" (wave to) the driver as the bus approaches. Each IndiGO bus is identified by a Route Number; for example, "Route 1." Each bus indicates the Route Number on the front and on the curb side of the vehicle, so it�s easy to identify your bus from different directions. If you are not at a marked stop, remember to stand in clear view of the driver and wave as the bus approaches. Waving to the driver is also helpful while standing at a marked bus stop, to let the driver know that you would like to board that particular bus. If you find it difficult to climb the front steps of the bus, ask the driver to lower the bus for you. Our buses have a special "kneeling feature" which lowers the first step to curb level. If you see a bus coming toward you that isn�t the one you want, wave the driver on. Allow departing passengers to exit the bus before you try to board. IndiGO fares are for all rides in Indiana County. Fare information is available on buses and in route schedules. All fares must be paid upon boarding bus. Card carrying passengers must show the driver their valid card when boarding. This includes I-Cards, Reduced Fare Cards, and Senior Cards. Drivers will usually bypass stops where no one is waiting, unless someone signals to get off. As the bus approaches within one block of your stop, signal the driver. Because of YOU, IndiGO Can be Proud of the Service it Provides! IndiGO and its employees have made a commitment to enhance the safety and security of the transit system, and to provide our customers with a pleasant experience when riding our local transit service. Security Cameras with Audio and Visual recording capability have been installed on all IndiGO buses for safety and training purposes. IndiGO drivers, supervisors, or local law enforcement may ask disruptive rider to leave the bus. For your safety, IndiGO's policy is that harassment, assaults, violent acts, or any other unlawful offense directed towards our customers or employees will not be tolerated. Such acts will be prosecuted to the fullest extent of the law. Bike racks have been installed on IndiGO's buses! This feature can save you time, money, and help protect our environment, too. Just ride your bike to a bus stop, put your bike on the rack, and hop on the bus! Biking and taking public transportation are excellent ways to help create alternate transit options - and that contribute to clear air and more livable communities. The bike racks on IndiGO buses can hold two bikes. If a bike rack is full or unavailable, IndiGO allows bicycles to be placed inside the bus when space permits. Either way, there is no charge for bringing your bike along. Step 1: Lower Rack - Squeeze center handle and pull down. Step 2: Load Bike - Place bike in one of the two bike spaces. Step 3: Secure Wheel - Pull the security arm over the bike's wheel to keep the bike in place. The only contact is with the wheel of the bike, so there is no damage to the bike frame. Each passenger is responsible for placing his or her bike on the bus, and for removing it. If you are finished using the bike rack and the rack is empty, please place the bike rack in the folded position. The first aisle-facing seats (behind the driver) are reserved for people with special needs, such as the elderly and people with disabilities. Please turn off the speaker function on all cell phones. IndiGO does permit you to bring food and drink aboard. Please be careful when doing so, and remove all trash when you exit the bus. Smoking on IndiGO vehicles and in IndiGO facilities is prohibited, this includes Electronic Cigarettes and Smoke by Vaporization. IndiGO welcomes service animals aboard our buses! A service animal is defined by law as any guide dog, signal dog or other animal individually trained to work or perform tasks for an individual with a disability. These tasks include but are not limited to guiding individuals with impaired vision, alerting individuals with impaired hearing to intruders or sounds, providing minimal protection or rescue work, pulling a wheelchair, or retrieving dropped items. IndiGO allows pets to be brought aboard, provided they meet certain criteria. Pets may be permitted on the bus if they are transported in a small cage. Your driver may deny any animal access to the bus, or request that you remove your pet where a safety or health problem exists. A rider may carry on only as many bags as he or she (the rider) can carry on and off the bus in one trip, without help. Drivers will not assist in carrying groceries on or off the vehicle. The lift or ramps will not be used to get groceries on or off the bus, whether being carried onto the vehicle by the rider of in a shopping cart, unless this is requested by the rider. Groceries and shopping carts must not block the aisle and must be secured by the rider so as not to present a hazard to other riders. Carts must be completely out of the aisle and secured by the passenger. If this is not possible, the driver may refuse to transport the passenger. If the bus is full, the passenger must use only one seating area to secure the cart and groceries. Under no circumstances will the groceries and the cart be stored in the wheel well or the door step area. The cart and groceries may be stored in the wheelchair area if secured by the passenger. If the wheelchair area is needed for a wheelchair rider, the passenger with the grocery and cart must move to another seating area. A wheelchair rider is limited to the number of bags and other groceries that can safely be attached to his or her wheelchair. This is determined by the stability of the chair, and by safety in allowing the driver to correctly tie down the wheelchair. If the wheelchair rider exceeds this limit, in the judgment of the driver the wheelchair rider will be told that if this occurs again, service may be denied. If the groceries or shopping cart cannot be accommodated under these guidelines due to the size of the cart and/or the groceries blocking or narrowing the aisle, the driver may deny the passenger a ride. No groceries are to be left unattended by the passenger, at any time, on the bus. Strollers must be secured by the rider in a manner so they do not block or narrow the bus aisle. Parents must remove their child from the stroller, and hold onto the stroller handle for safety. Parents may hold their child on their lap or place the child alongside them in the bus seat. Parents must place the stroller out of the aisle. Parents may place their stroller in the area designated for wheelchairs if this space is open. However, the stroller cannot be secured by wheelchair restraints, and the parent must move the stroller if the wheelchair space is needed for a wheelchair rider. A rider with a stroller must request the use of the lift or ramp from the driver if needed to board the stroller. If the rider does not request the use of the lift or ramp, the rider is responsible for boarding and deboarding the stroller. Drivers will not assist with the boarding or deboarding of the stroller except for deploying the lift or ramp, and restoring it upon deboarding. If the stroller cannot be accommodated under these guidelines due to the size of the stroller and/or the stroller blocking or narrowing the aisle, the driver may deny the passenger a ride. Please keep in mind that all schedules are affected by road, traffic, and weather conditions! During harsh winter weather, be aware that ice and snow may cause schedule changes. Just give us a call at (724) 465-2140 to check for delays. 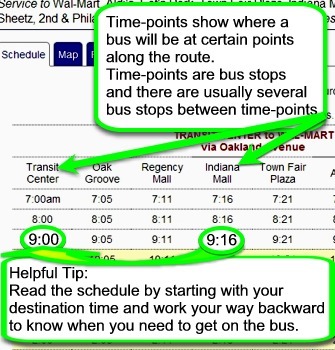 Our website, www.indigobus.com, is also a great source of timely information.